Entries are open to female amateur golfers who play at clubs or courses who are members of the Missouri Golf Association. Must have a current USGA Handicap Index from an authorized USGA club. Entries must be correctly completed, including mandatory Hdcp/I information. The field shall be determined by the first 160 entrants/ 80 teams. Additional entries shall be placed on a waiting list in the order received. All entrants are expected to complete tournament play. If one withdraws for a reason deemed unacceptable by Tournament Committee, she may be ineligible to play in further MGA events. Accepted entries will be posted on the MGA web site and competitors will be notified by email. Contestants without email access should call our office at 573-636-8994 for entry or other information. This is a thirty-six (36) hole, two lady scramble competition. Round one: Teams will be paired according to team handicap index. In Round 2 each team will be flighted and paired based on first round score. The two day low gross score shall determine the Scramble team winners in each flight. Ties for tournament winner will be decided by a sudden death playoff, all other ties will be decided according to USGA Rules of Golf, Appendix 1, Part C, Section 10, Stoke Play (c), paragraph 1 (last nine holes shall be 10-18). Play is governed by The Rules of Golf as approved by the USGA, and where applicable, by Local Rules consistent with USGA Rules. 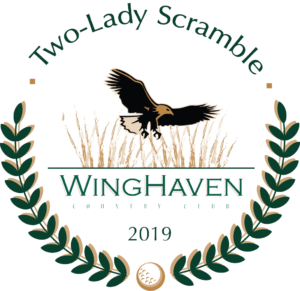 Please call WingHaven to schedule your practice round. This is the only day available for a practice round. Cancellations before the close of entries will be refunded less a $30 fee. There are no refunds after the deadline date. Player Reception after the first round. Championship Rounds, Range Balls and Cart Fees.